From my days in Emergency Medicine I know the value of having small bills. (After an earthquake the ATMs don't work.) In my pack I have a hundred dollars or so in two dollar bills, my favorite denomination. Those small bills came in very handy when we met the Sushi Girls. 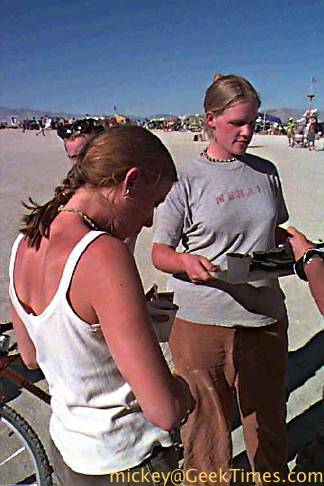 That's right, you heard it correctly, sushi in the desert of Burning Man. Here you see one of the Sushi Girls surrounded by excited customers. The price was cheap, the sushi was ice-cold and plentiful, and the wasabi was fresh and strong. 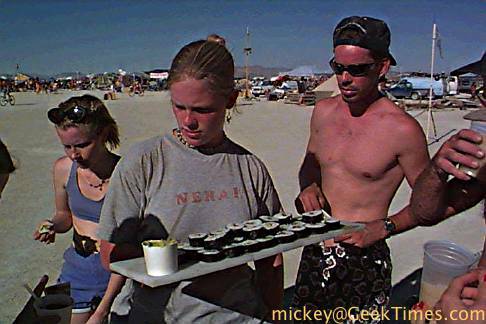 Here are the Sushi Girls, posed as they deliver another tray of happiness. Mmmm, where are they now, I wonder...?